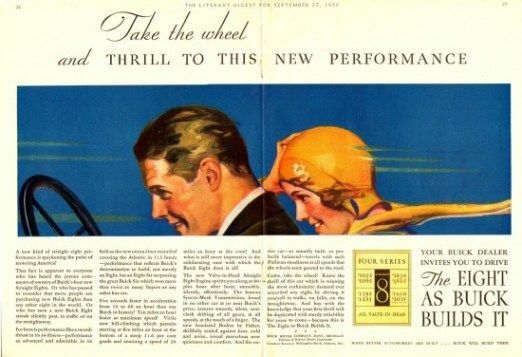 1931 was an interesting year in automotive history. Buick being a top luxury brand during the beginnings of the great depression actually had the 3rd highest sales in the auto industry. Wealthy "white collars" such as doctors and entertainers who stayed employed during the great depression kept luxury cars in demand. If they were confident enough to buy a new car in 1931, you bet a luxury Buick was considered with their brand new straight 8 engine. Buick's slogan; “When better cars are built, Buick will build them” was heavily advertised and well known among the new car buyers in the market. 1931 was the first year for their revolutionary OHV straight 8 platform that was used in all Buicks through 1952. GM had deviated from the popular flathead design and hit a home run with this engine. Being such a heavy car with a heavy engine, large wheels were used to allow large drum brakes to fit. This was the last year of mechanical brakes before hydraulic became standard in 1932. If you bought a new 1931 Buick it came standard with automatic spark advance and syncromesh in 2nd and 3rd gears. Buick was well on their way to operating more like a modern car. This particular Buick was built new as a "Opera Coupe" with a hidden compartment to hide champagne or other beverages and a fold down passenger seats to allow the entertainers to fit in the back comfortably. The car was restored to all original specifications and is just an outstanding automobile. Looking at the interior, it just begs you to run your hand across the soft upholstery and the beautiful chromed handles. These are the parts that they just don’t put in cars anymore. The beautiful dash panel features; amp, coolant temp, oil pressure and speedometer instruments. Overall this is an extraordinary piece of Buick history and represents why Buick is such a long time, quality, successful automobile brand.